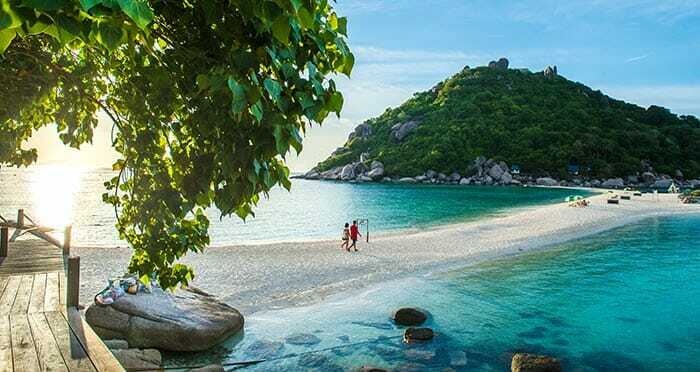 Two of the most amazing islands in Thailand, and possibly the world, are Koh Tao and Koh Phangan, and although they have similarities there are also plenty of things that set these islands apart too. The quiet of the two, Koh Tao boasts many beautiful beaches, breathtaking scenery, and wildlife and it’s becoming a top-notch diving destination too. The laid-back atmosphere makes this ideal for couples and families looking for a relaxing escape. Hop over to the larger and busier Koh Phangan for a change of pace. Koh Phangan is the fifth largest Thai island and hosts the famous Full Moon Parties so there’s nightlife here and a vibrant atmosphere, yet the beaches are still amazing if you’re not quite done with your beach days! It’s just 44 kilometers (27.5 miles) between the islands of Koh Tao and Koh Phangan, heading north within the Gulf of Thailand. 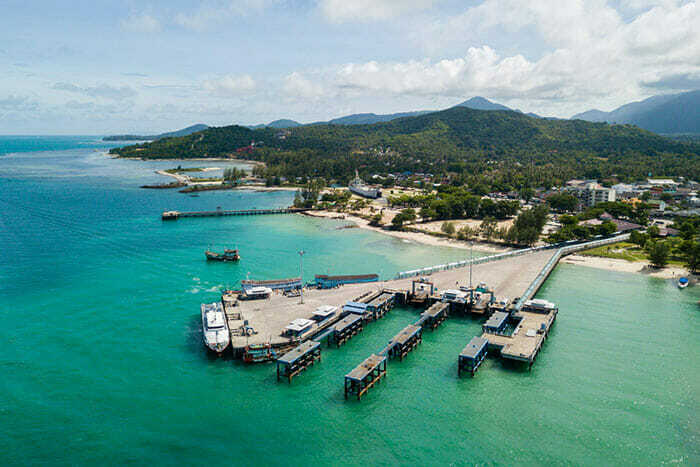 The only way to travel from Koh Tao to Koh Phangan is by ferry, as neither island has an airport – although an airport for Koh Phangan has been in the pipeline for some years now. The good news is that because Koh Tao doesn’t have, and is unlikely to ever have, an airport, this island has retained its quiet charm and because catching a ferry is the only way to get here this has dissuaded some tourists from visiting. This is great news for you! Traveling by ferry from Koh Tao to Koh Phangan is not as bad as it might sound – there are actually three different ferry options you can choose from, and they vary according to price, speed, comfort levels and schedules, so you should easily be able to find something to suit your budget and itinerary. For the budget-conscious traveler, it’s always great to find the cheapest way to travel from Koh Tao to Koh Phangan! All ferries are reasonably priced, but the service with Songserm is quite a bit cheaper than the other two companies. Of course, there is a reason why it’s cheaper… Songserm’s ferry is the slowest of them all with a scheduled journey time of 2 hours, but this is only 30 minutes longer than Seatran, and about 45 minutes longer than traveling with Lomprayah, so although it will take longer, the savings are well worth it. And you don’t need to be worried about sacrificing safety if you book with Songserm. They operate relatively high-speed ferries that are perfectly comfortable and safe. They have washrooms onboard and TV’s, and there are options to sit inside the ferry, or on one of the outer decks if you want to enjoy the breeze, the sea air and the scenery. 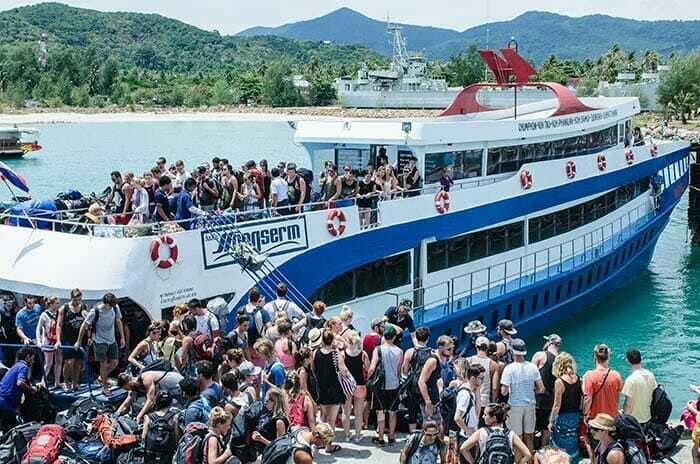 A drawback with booking a ferry from Koh Tao to Koh Phangan with Songserm is that they only operate one ferry per day, departing from Koh Tao at 9:30 am and arriving at 11:30 am. This makes their service a little less flexible than others as you will have to run to their schedule, but if you’re planning to travel from Koh Tao to Koh Phangan and want to get there in the morning anyway, this could suit you perfectly! 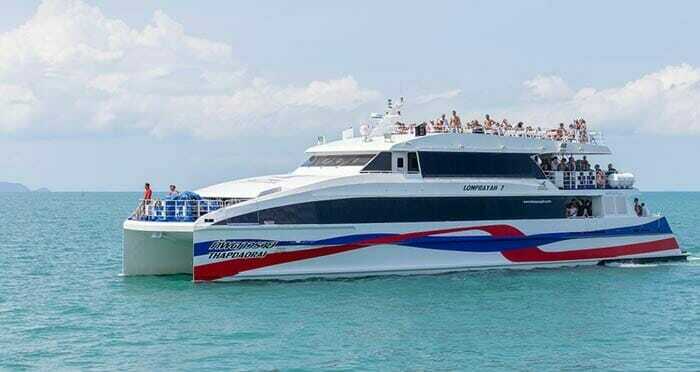 Lomprayah’s High-Speed Catamaran is the fastest way to travel from Koh Tao to Koh Phangan. As you would expect, speed equals expense and Lomprayah’s ferry is the most expensive out of the three companies. Having said that, it’s not significantly more expensive than traveling with Seatran, so if you’re happy to spend more over and above the cost of Songserm, the difference is unlikely to put you off. So, what do you get for the extra price of a ticket with Lomprayah? First, there’s the speed. It takes only about 1 hour and 15 minutes to travel from Koh Tao to Koh Phangan on their high-speed catamaran. This boat is spacious, has plenty of comfortable seats inside, and has outer decks if you prefer. There is also a snack service on board if you’re feeling hungry or thirsty, and there are of course washrooms. Schedule wise, Lomprayah gives you several different departure times. There are usually at least two departures per day and sometimes three during high season, with two in the morning and one in the afternoon, departing from Koh Tao’s Mae Haad Pier and arriving at Thong Sala Pier on Koh Phangan. Thong Sala Pier on Koh Phangan. Taking a ferry from Koh Tao to Koh Phangan with Seatran Discovery is a good compromise. Seatran’s high-speed ferries are cheaper than Lomprayah and take just a little bit longer with a crossing time of around 90 minutes. The ferries are modern and well equipped with everything that Lomprayah’s catamarans offer, so there’s not a lot to set one apart from the other. There are always three departures per day with Seatran, which can be one more than Lomprayah at certain times, making it perhaps easier to find tickets. Talking of tickets, you can buy them for all three of these ferry companies traveling from Koh Tao to Koh Phangan on the travel website 12Go.asia. This reputable website provides results for all ferries, making it easy to compare the services, schedules and prices and provides peace of mind when it comes to booking. Seatran ferries also depart from Mae Haad and arrive at Thong Sala. There are a couple of things you may like to bear in mind when deciding on which ferry from Koh Tao to Koh Phangan; firstly, if the sea is too choppy services may have to be cancelled for your own safety – this is more likely to happen during the low season when the weather can be unpredictable. Secondly, even during relatively calm weather the water can be choppy and this is highlighted more when you’re traveling on a catamaran compared to a regular ferry. If you’re prone to feeling sea sick, choosing Seatran’s ferry or Songserm’s ferry may be a better idea!